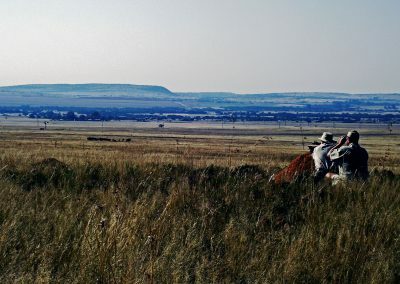 Hunting areas and hunting camps South Africa. The hunting areas and hunting camps South Africa have all been quality inspected by ourselves. Accommodation in the hunting areas and hunting camps South Africa mostly consist of a thatch roof hut that is fitted with the following amenities: running hot- and cold water faucets, a shower, or shower and bathtub combination. A flushing toilet is standard and enough lights allow you to keep your diary up to date or to read something interesting. In some of the very cold hunting areas in South Africa (cold per our standards would be in the upper 30-degree F region, between June and July) a fireplace adds a unique and comforting heat source. All linen, blankets, pillows and bath towels are supplied but it is not customary for us to supply a face cloth. Your laundry is taken care of on a daily basis and in most cases returned to your room the same day. If we experience bad weather, laundry will be returned the following morning. The all-inclusive hunting safari packages take care of all these smaller issues so you can enjoy your hunt to the maximum. We offer South African hunting safari packages on hunting farms that have a wide variety of game animals available to satisfy your hunting wish list. We hunt different hunting areas and hunting camps South Africa to ensure you get the trophy animals you came for. If you are looking for African hunting safaris on a budget, then you are with the correct African hunting company. South African hunting safaris under a $ 4 000-00 budget are on offer. 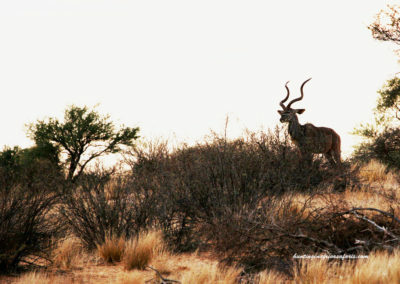 If you hunt on a 2X1 basis your kudu hunting packages will be under the usual $ 5 000-00 budget. 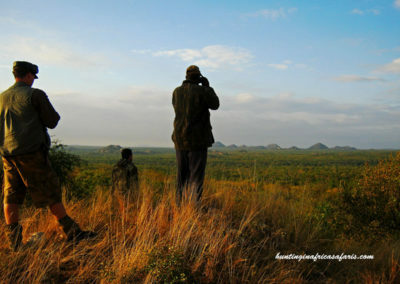 Remember that most affordable hunting safaris Africa (including airfare), is usually a sales gimmick. To make the hunting packages attractive an amount is included in your hunting package which is mostly less than your actual airfare. Budget for your South African hunting safari according to what you feel comfortable spending and add airfare on top once you know what the flight actually costs. Our hunting areas and hunting camps South Africa comply with all regulations to ensure you have a comfortable stay. A light breakfast is served at 6 am that consists of yoghurt, fresh fruit, muesli, corn flakes and other cereals together with rusks (a local delicacy) and coffee or tea. By 6 30 am the sky light enough to see properly and we set off to hunt our designated area for the day. If we are lucky enough to harvest an animal within the first few hours of the hunt we return to the skinning shed asap. At the skinning shed an experienced skinner will skin the animal according to your instructions. This is where some of the prime cuts of meat will be utilized for you to taste what you hunted. A short siesta sees us depart for hunting again at about 2 pm when we will return (hopefully) to the skinning shed. After you freshen up we have a few cold ones by the welcoming bushveld fire, reliving the happenings of the day. Tomorrow we start all over again! Please bear in mind this is Africa where we have something known as Africa time. This means a set departure time may or may not be the specified time and we can run up to 15 minutes late. Do not let this dampen your enthusiasm as there is always a very good reason for any delay! Some of the local farmers we meet up with are very religious people who will say a prayer before each meal while others will hold hands for the duration of the prayer. If you are not a religious person all we ask is to respect the local customs. 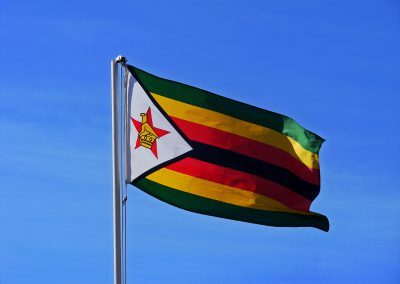 Yet another interesting feature we may come across is when a host only speaks in Afrikaans (one of South Africa’s nine official languages) to your PH. This is not because the host is unfriendly but simply due to the fact that he cannot speak English fluently enough to feel comfortable speaking to you. Bringing a binocular along is a must as there are so many things to see even when not hunting. South Africa boasts more than 500 different bird species of which most are rather colorful and a delight to come across. One of the more recognisable species would be the southern yellow-billed hornbill, also known as Zazu in the epic animation move: The Lion King. © Copyright 2016 Hunting in Africa Safaris.